Eat Fresh, Day 10: The key to making a resolution stick? Making it fun. This year I’ve decided to: be a more creative, dedicated chef, starting with a two-week streak of trying a new, made-from-scratch recipe every day. So far, it’s: been great. I’ve discovered some tasty dishes that are easy enough to make on a weeknight and grown way more comfortable and confident in the kitchen. Last night, while prepping this chicken stew with olives, lemon, and artichoke hearts, I realized I didn’t have enough potatoes, so I swapped in quinoa instead—and it turned out wonderfully rich and flavorful. (It reminded me of a Moroccan tagine dish, in the best possible way.) I’m usually wary of recipe substitutions—what if I screw it up? !—but after nearly a dozen nights in a row of culinary experimentation, branching out and pushing myself to be more daring, I felt a-okay going for it. Another surprising bonus: Feeling more comfortable in the kitchen has also made cooking a whole lot more fun. My biggest temptation to cheat: Honestly, right now: none. I feel more motivated than ever. I’ve amassed such a big, bookmarked and pinned collection of recipes to try that I’m eager to keep cooking. Coping mechanisms: Making it fun. I crank up some music, do my bad, awkward-guest-at-a-wedding dance around, and zone out for a bit. That hour or so in the kitchen has become like a yoga session: Yeah, it’s work, but I know I’m doing something good for myself, so it’s enjoyable. That and being prepared heading into the week. I’ve been trying to do most of my grocery shopping on the weekend, so that, after a full day of work and long commute home, all I have to do is chop, cook, and then eat and enjoy! 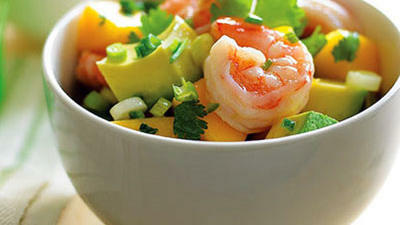 A recipe I’m digging: Tonight, I’m making this spinach, leek, and potato soup, and then I’m eyeing this simple avocado, mango, and shrimp salad dish!